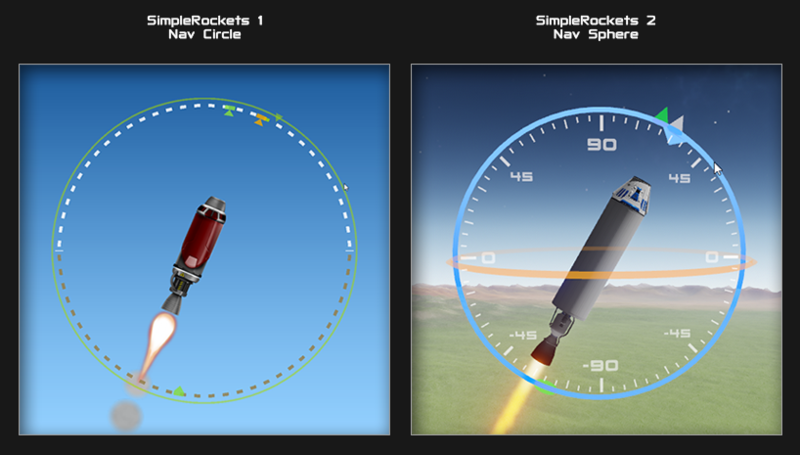 The Nav Circle in SR1 made it very easy to control rockets in a 2D game. It took me a while to figure out the best way to extend the Nav Circle into three dimensions. I ended up with basically two nav circles: one for heading and one for pitch. The end result is now called the Nav Sphere and it makes controlling rockets in 3D extremely easy. The blue circle is for controlling the pitch of the rocket and the orange circle is for controlling the heading. You can click and drag the circles to adjust them or you can use keyboard inputs (or a gamepad) to control them. We will probably tweak the visuals a bit before release, but I'm really happy with how they've turned out. I’m sure this will be awesome on mobile, but it’s kind of hard to use on PC. Maybe I’m just used to SimplePlanes and KSP. @MrNarwhal35 Ah, my apologies. I must have misunderstood what you said. @Bmcclory Well for one, I was the one saying that the modders would take care of the mechjeb type thing, then you tried to argue with me by agreeing with my stance. Second, I don't care if they add that to the game... I don't need it, not sure where you got "Even if it doesn't come, you can still get enjoyment out of the game" from. @MrNarwhal35 I'm rereading it and everything seems right, maybe you could clarify you're question so my not-very-smart brain could understand? @Bmcclory what about the mobile app? @Gregrox @Venus You can used the wasd keys and remove the navball, I asked Andrew in one of my earlier comments. I hope you will also have the conventional arrow-key type controls (with a stabilizer like KSP's SAS, hopefully) because with only two axes, you can have a problem similar to Dobson's Hold with dobsonian telescopes (using an altitude/azimuth cannon-like aiming scheme). Near the poles of the sphere it can be difficult to point where you want to go. (Similar problem to Gimbal lock) Also, no way to roll! This can be disastrous if you're trying to dock things in space that need precise alignments. So while this may be useful for simple piloting, I would definitely prefer to use a joystick or arrow-key like system. Also now that we have three dimensions, maybe you could display icons for normal/antinormal and radial/antiradial orbit directions, in addition to prograde/retrograde. This is still a smartphone game in addition to PC, right? While I think the game COULD compete with KSP on the PC, I am particularly interested in the mobile version. Are you talking about a copy of mechjeb, or the air breathing engines? If it is the air breathing engines, it would be pretty easy to do, just make an engine check for an intake, and check how much it needs, tbh it isn't as hard as mechjeb. @Bmcclory I'm just saying, something like that requires a ton of work as well as a pretty good knowledge of astrophysics. Not that the devs can't do it, but it would be a huge use of time and resources, and something that I'm sure plenty of modders already plan to do anyway. @AndrewGarrison will the rotate a nudge mechanics of simpleplanes be the same we see in simplerockets, or maybe better? @Chancey21 there's blog posts about both screenshots, and wings. Andrew mentioned in this comment section that there will be additional controls. And again, I will not support SR2 if it does not support airplanes.